One of our century's greatest authorities on the ancient world gives us here a vivid account of the Jewish people from the conquest of Palestine by Alexander the Great in 332 B.C.E. to the revolt of the Maccabees. It is a rich story of Jewish social, economic, and intellectual life and of the relations between the Jewish community and the Hellenistic rulers and colonizers of Palestine-a historical narrative told with consummate skill.Bickerman portrays Jewish life in the context of a broader picture of the Near East and traces the interaction between the Jewish and Greek worlds throughout this period. 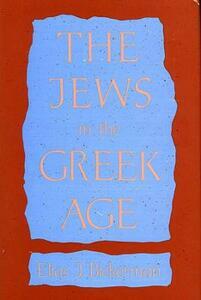 He reconstructs the evidence concerning social and political structures; the economy of Hellenistic Jerusalem and Judea; Greek officials, merchants, and entrepreneurs as well as full-scale Greek colonies in Palestine; the impact of Greek language and culture among Jews and the translation of Jewish Scriptures into Greek; Jewish literature, learning, and law; and the diaspora in the Hellenistic period. He deploys his profound knowledge gracefully, weaving archaeological finds, literary traditions, the political and economic record, and fertile insights into an abundant and lively history. This first full study of the pre-Maccabean interaction between the Greek and Jewish cultures will be welcomed by historians and specialists in Judaic studies. But any reader interested in the ancient Mediterranean world will find it to be filled with pleasures and discoveries.